Did you know the Bukhara restaurant at Suria KLCC was actually opened to showcase the inter-cultural culinary heritage of the Silk Road pursuant to our former Prime Minister, Tun Mahathir Mohamad’s visit to the fabled city of Bukhara in Uzbekistan? That's right. Bukhara is not a Middle-Eastern restaurant but was named after one of the oldest Uzbek cities of the same name. Famed for its historical and architectural splendours, Bukhara is set on the great caravan crossroads, near the Taklamakan Desert where the Silk Road spans across from China to the Western World. Consequently, the Bukhara restaurant simply encapsulates a varied selection of Central Asian specialties in its menu. Meaning diners will have an insight into this criss-crossing of Chinese, Indian, Mediterranean and Middle-Eastern cultures and cuisines due to the bustling spice and silk trade along the dense network of large cities and smaller towns, starting from Xian to Istanbul from the second to fifteenth century. What the Bukhara chefs have done is refined and modernised the visual presentation of these rustic and unsophisticated dishes while retaining the original flavours. Our evening started off well with Taklamakan Chill (RM9.80++), an invigorating concoction of honey, ginger ale, lemon slices and mint and Shalala Sunrise (RM9.80++), a zesty blend of pineapple, orange and lemon juices. The Lamb Shurva (RM14++), hearty lamb stew thickened with spiced lentils is a flavourful broth that must be eaten with Bukhara’s assorted homemade breads. We had a fair idea of just how much the Middle-Eastern, Indian and Mediterranean influences have left their mark on Central Asian cuisine with the Paneer Falafel (RM16++) and Oyster Fritters (RM28++). Deliciously crisp on the outside and oozing with melted cottage cheese inside, the fried chickpea and sesame seed croquettes are representative of the first two facets whilst the fried oysters in crisp batter are clearly a Mediterranean inspiration. Other noteworthy appetizers include Honey Date Fritters (RM16++), Dukka Prawns (RM20++), deep-fried prawns coated with Middle-Eastern spices and Bukhara Meze (RM22++), a platter of ‘hummus’ (chickpea purée), pickled dills, dates, fried cornmeal, mashed tuna, ‘falafel’ (fried chickpea balls) and ‘dolmas’(rolled up grape leaves with spiced rice and minced meat filling). A firm favourite with our former premier, the Barbecued Chicken with Sumak (RM32++) is reputedly one of Bukhara’s best-selling dishes. No prizes for guessing why as a whole succulent chicken leg has been marinated with a mixture of aromatic Middle Eastern spices prior to it being grilled to perfection. We thoroughly relished it with the accopanying piquant sauce that was mildly sweet and fruity. Lamb is popular in Central Asia so it is only natural specialities such as Moussaka (baked minced lamb with layers of eggplant and yoghurt RM30++), Flame-Grilled Marinated Lamb Rack (RM45++) and Lamb Kebab (RM36++) can be found in the menu. We daresay the skewered lamb with Mediterranean-style vegetables and a citrusy barbecue sauce was truly sublime as the tender meat was richly imbued with a spiced marinade. The Bukhara Pollo (RM25++) and Hyderabadi Biryani (RM25++) are two rice dishes evocative of the Silk Route's famous spice trade. Cooked in a pot sealed with a layer of pastry dough on top, the former was scrumptious as all the wonderful flavours of the various ingredients – marinated chicken pieces, raisins, cashew nuts, cloves and hard-boiled egg -- were fully absorbed by the highland rice. If you choose to have the latter, you’d find the lamb, cardamoms and a whole green chilli render it stronger and spicier in flavour. To conclude, sweet-toothed diners can opt for the Grand Selection (RM28++) featuring an assortment of Bukhara’s desserts in miniature portions. 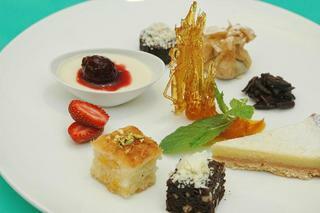 It constitutes warm semolina cake, lemon tart, cardamom cream, ‘baklava’ (caramelized almonds, pistachios and walnut in a fillo purse), chocolate brownie and ‘basboosah’ (coconut pastry with hints of rose water, cinnamon, walnuts, and sugar syrup). We suspect the only stumbling block to the outlet’s even greater success is its slightly upmarket and elegant ambience which can be intimidating. Once they overcome the initial fear of stepping in, many will find the outlet is pretty inviting with its desert sand dunes patterned walls, coupled with natural wood and glass accents. Décor is kept to a minimum with some Islamic calligraphy artworks and pottery on display. Diners won’t have any problems getting the wait staff’s attention as each table is equipped with a small, wireless gadget that summons designated service personnel to the customers’ tables for placement of orders, bill settlement or any form of assistance during their meals. So if you have yet to discover what Bukhara has to offer, now is a good time as any to go for a Silk Road experience. Mini turkey? Nope it's a Spring Chicken! Codfish & Mash...Quirky but Yummy!